Snapshot-based? No Yes/No, VMware says that vSR doesn’t use snapshots technology but does use a modified version of CBT, still many of the same snapshot-based limitations apply. For example, vSR uses VM snapshots at the recovery site when recovering to a different point-in-time. Compatibility: Zerto works with ESX 4.0 U1 and above. Zerto can replicate between different versions of vCenter. vSR works with ESX 5.x and above. SRM requires the same version of vCenter and SRM be installed at both sites. This entry was posted in VMware, Zerto and tagged Zerto vs vSphere Replication. Passing mark is atleast 75%, answers are highlighted in bold. 1) After performing a failover operation (Test, Live, Move) Zerto allows you to generate a report detailing the steps performed during the operation. 2) VPGs can only protect virtual machines running Mac OS X or Windows XP and newer. 3) To recover a single VPG after a corrupted database, which of these operations would be most effective? 4) ZVR’s Journal is stored where? 5) During a VPG sync, which of the following operations can be performed? Select all that apply. 6) Offsite Backups for a VPG should be scheduled to run at least every four hours, but no more than every 12 hours. 7) How much memory can be allocated to a Virtual Replication Appliance? 8) If both sites (target/recovery and source/production) are up, healthy, and accessible, which VPG-level operation is most appropriate? 9) What basic method does ZVR use to protect data and applications? 10) ZVR cannot function across different hypervisors, storage configurations, or host OS versions. 11) What must be true for a Move operation to be effective? Select all that apply. 12) A fully configured ZVM on each paired site—e.g. production and recovery—requires which of the following? Select all that apply. 13) Enabling auto-commit will always provide 30 minutes to validate the results of a failover before committing the changes. 14) ZVR has built-in support for scheduled bandwidth throttling that can work with or without other hardware/software also managing this. 15) What characterizes the kinds of VMs you should group together in the same VPG? 17) What is the Journal? 18) The ZVR installer includes which of the following components? Select all that apply. 19) If you needed to test the failover of an entire virtualized datacenter, what best practices should be followed? Select all that apply. 20) What is a Virtual Replication Appliance? 21) ZVR 4.5 allows for Journal Compression to increase storage capacity for journal history. 22) If the hypervisor service/admin account provided during installation is incorrect, ZVR will still proceed with the installation and ask for re-validation after installation is complete. 23) When configuring a Failover Test network, what is Zerto’s recommended best practice? 24) What operating system is running on the VRA virtual machine? 25) What VPG configuration option would give you the ability to stagger when and how your protected VMs start? This entry was posted in Certifications, Zerto and tagged ZCP Certification Exam, ZCP Dump, ZCP Q and A. Are you a Master of Disaster? 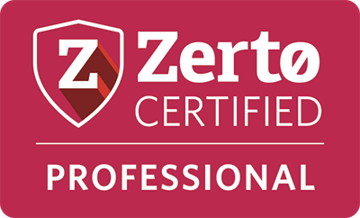 Join the ranks of masters worldwide who have taken our Zerto Certified Professional (ZCP) training and are now using Zerto to minimize data loss and maximize uptime. Zerto has just released our business continuity certification, ZCP Basic for Zerto Virtual Replication (ZVR) 4.5, the latest version of Zerto’s award-winning business continuity software. ZCP Basic 4.5 is a free introductory technical course that is self-paced and easily accessible online via the MyZerto platform. If you don’t already have an account, sign-up for one here and then log-in to start your training. The latest ZCP course includes training on some of our exciting new features such as Journal File-Level Restore, ZVR 4.5’s game-changing feature that lets you recover specific folders or simply one single file that was accidentally deleted. If you are a newbie though, don’t worry, ZCP 4.5 still covers all the tools you need to reach Master of Disaster status, including: ZVR installation, configuration, and key recovery operations such as test & live failovers. The e-learning in ZCP Basic 4.5 is estimated to take around 1 hour and 15 minutes, and there is a certification exam at the end. Passing the exam with 75% or higher awards you the ZCP Basic business continuity certification—and officially recognizes you as a Master of Disaster, ready to face any outage and manage your IT environment with confidence. Additionally Zerto is excited to announce that they are taking our training to the next level! This May, at ZertoCON, they will be offering for the first time ever the ZCP Advanced certification exam! So for those of you who are interested in really putting your skills to the test, and looking for official proof of your elite BC/DR status, sign up for ZertoCON now. This entry was posted in Certifications, Zerto and tagged ZCP, Zerto Certified Professional, Zerto Certified Professional Training.